The finish work on the cabin is trudging along at a snail's paste and I am ready, ready, READY to start decorating. We missed our February deadline. I was able to negotiate a one year extension to next February with the water board (day job skills kicking in here), but this just gives us permission to dawdle even more. If you aren't familiar with the big, scary deadline that has been looming over us for the last several years, click here. The short story for those who can't tear themselves away from this riveting tale of OCD shopping: keeping our water permit is contingent on us getting our certificate to occupy by a specific deadline. So, because I'm frustrated with the slow pace, and because there is little I can do to help finish the cabin (I can paint, apply wood stain, and stand around and dictate design decisions...we'll see how that works out; I'm feeling a little iffy about the shower, which was my idea), I've been shopping madly. Systematically scouring all the local antique stores, looking, looking, looking for all those elusive items that will spell unique, cabin perfection and guarantee a lifetime of relaxed happiness in our little place far from the madding crowd. Thanks to some really terrific finds over the past few weeks, I've been able to cross several of these items off of my list and add to the growing pile of cabin stuff waiting to be transported to the finished cabin. My husband and I are so delighted that our house is turning into a warehouse for the storage of cabin furniture and other related items. I'm so excited about this little table. This is probably the one and only time that I didn't go through my normal indecisive routine where I walk around the store for 30 minutes trying to decide whether I really want the thing or not (or leave, think about it for a few days, and then return, to look at it again and think some more). It was absolutely the right size and shape, had enough storage options, and had the right look for what I have in mind. So I bought it immediately. 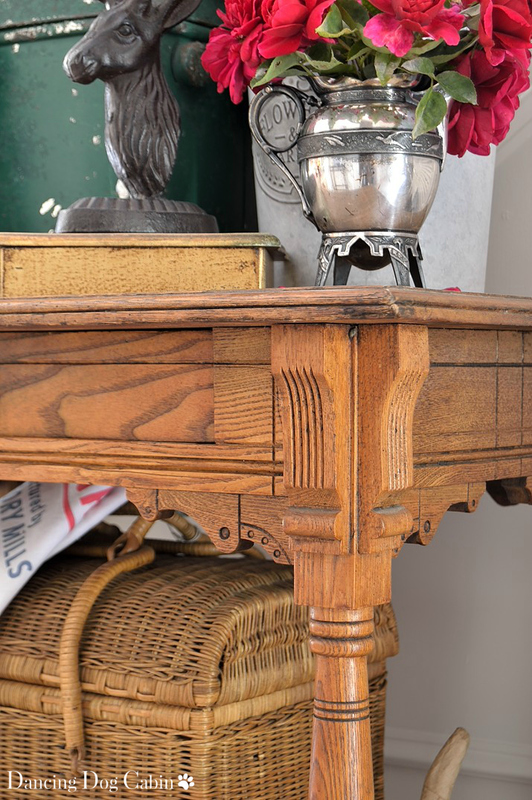 It is solid wood (looks like oak) construction and simple, geometric details leads me to believe it is likely an Eastlake piece (probably mass produced in the U.S.), a type of furniture produced between 1870 and 1890. 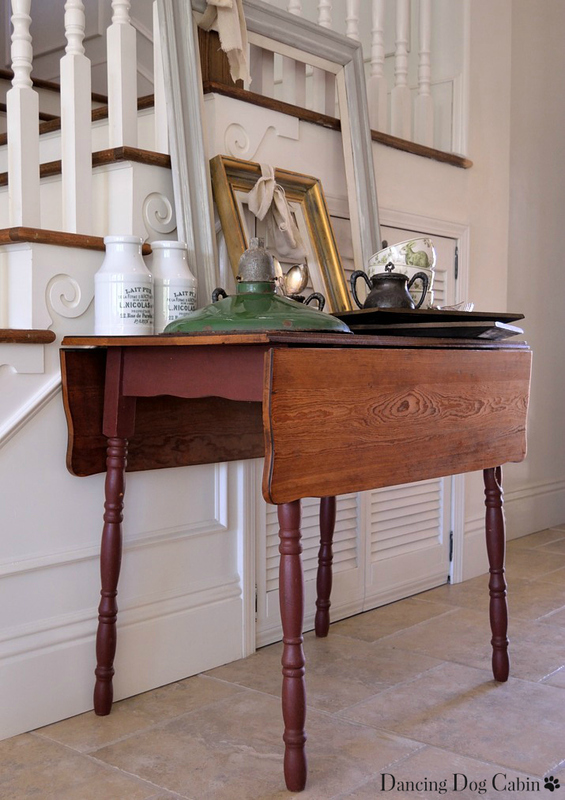 According to this website (click here), the creation this style of furniture was in response to English architect Charles Lock Eastlake urging late 19th century designers to veer away from the over-the-top, intricate ornamentation typical of Victorian-era furniture and decorating styles. 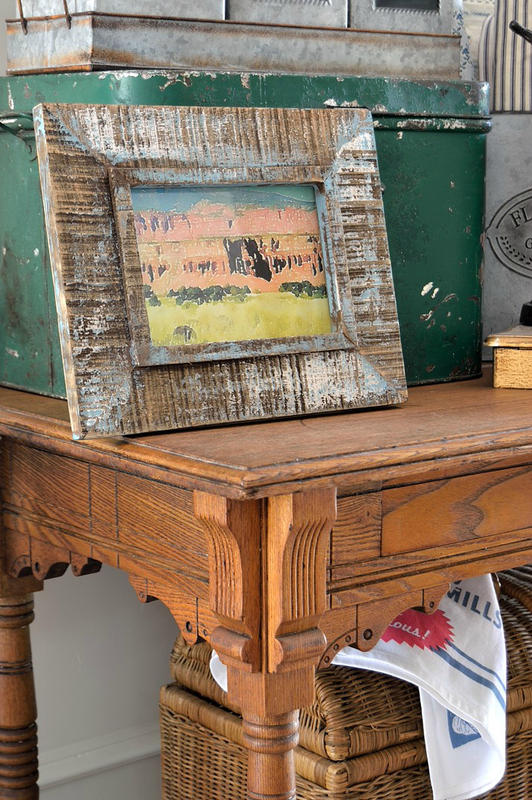 The simple, straightforward detailing of this table will be perfect in a mildly rustic cabin setting that has a touch of vintage style. Still looking for a companion bedside table to go along with this one. 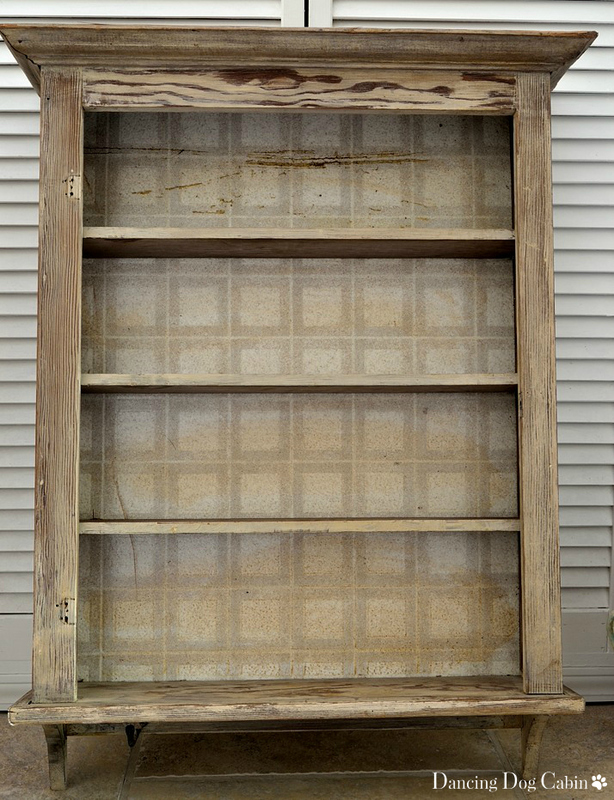 In the spirit of recycling and re-using what we already have, I'm going to paint/re-finish a bed frame that my husband made years ago (no photos available right now). I found this table last summer (click here for more on this). I'm planning on painting the base and re-finishing the top. 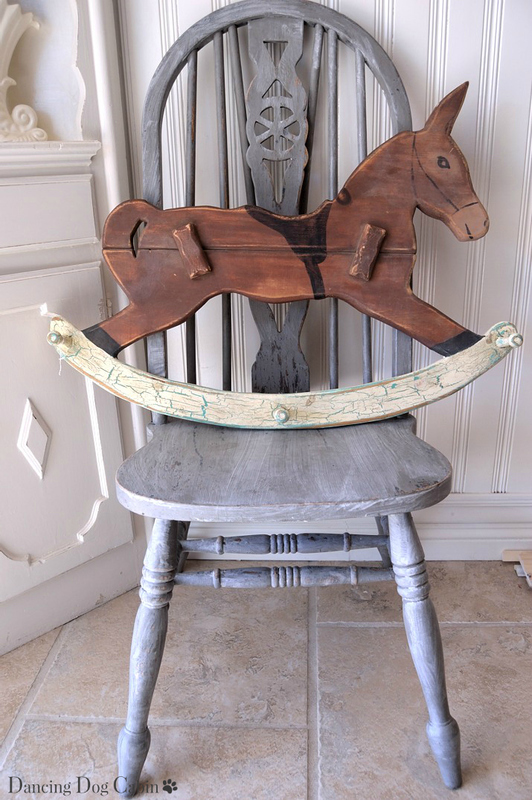 I found two chairs which seemed perfect at the time (for painting-see photo below), but now am having second thoughts since I broke the cardinal rule and bought rickety chairs. So we'll see if I end up using them. I've been hunting long and hard for something to go over the bathroom sink. 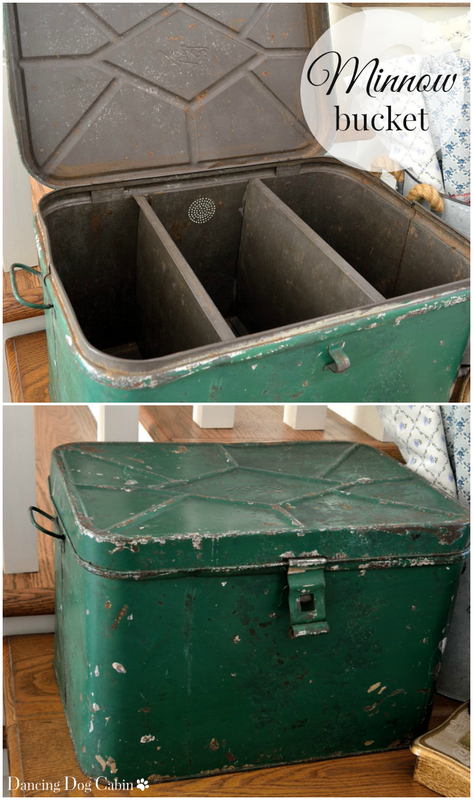 And then I found this last weekend....It has all the criteria I list above plus storage. I can never resist storage. However, it will likely not work with the vanity light that I have already purchased, which doesn't stick out far enough from the wall. Which means I may need to buy a different kind of vanity light.... we'll see. ...and the intricate detail on the feet, which look like animal paws. Another old vanity cabinet that I will use somewhere for open shelving (living/bedroom area? kitchen?). 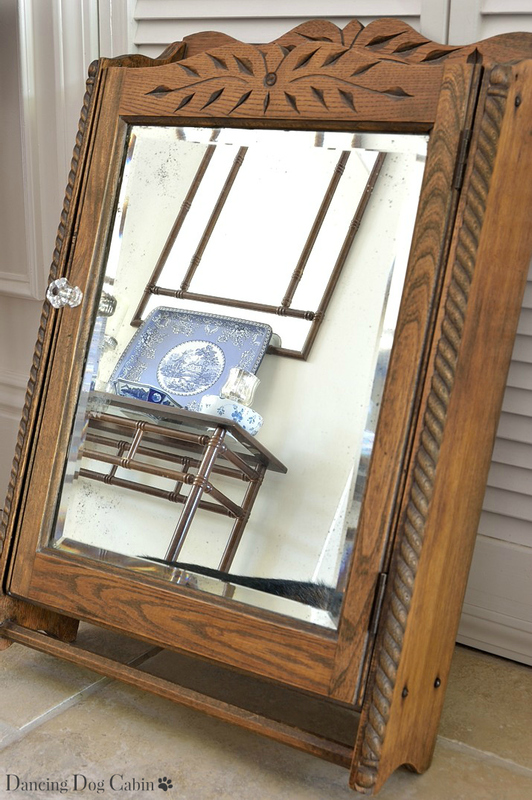 I had initially planned on using this on the bathroom wall opposite the sink, but if I end up using the mirrored vanity cabinet, that might be too much shelving hanging on the walls of a very tiny bathroom. The ugly linoleum backing will definitely be going away and be replaced with?? I immediately fell in love with this mule, and apparently the feeling was mutual, because he insisted on coming home with me. 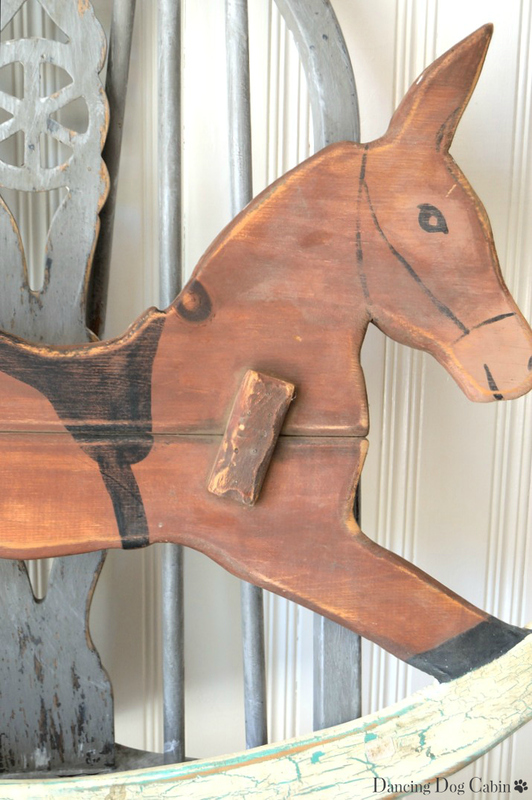 Perfect for a cabin located in rugged, rocky country where sure-footed mules and burros were once used to transport people and goods (think pioneers forging westward in their covered wagons or scruffy miners prospecting in remote mountain areas). So many fun things that I can't wait to start playing around with! 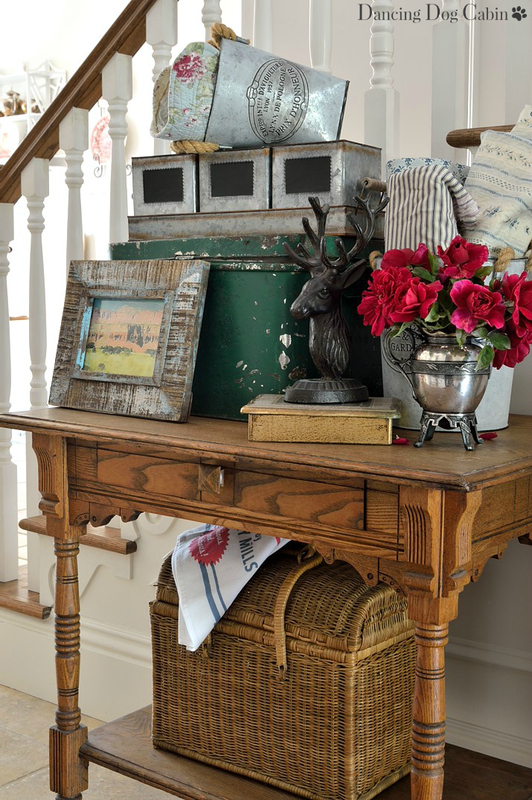 Decorating a cabin sounds like so much fun - you have found some great pieces. 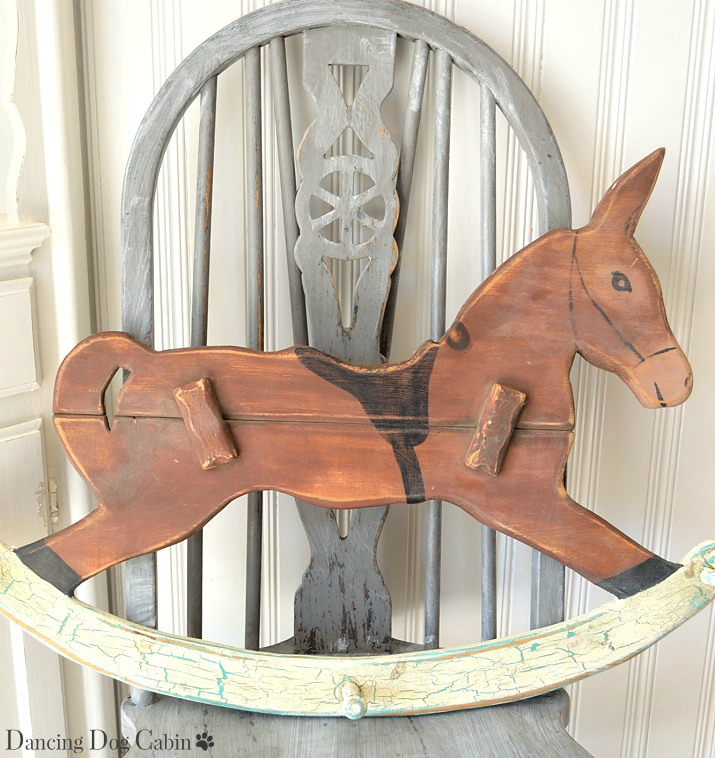 I love the adorable mule, he was definitely meant to be yours! Thank you! Yes, it's been a lot of fun (sometimes challenging too)! 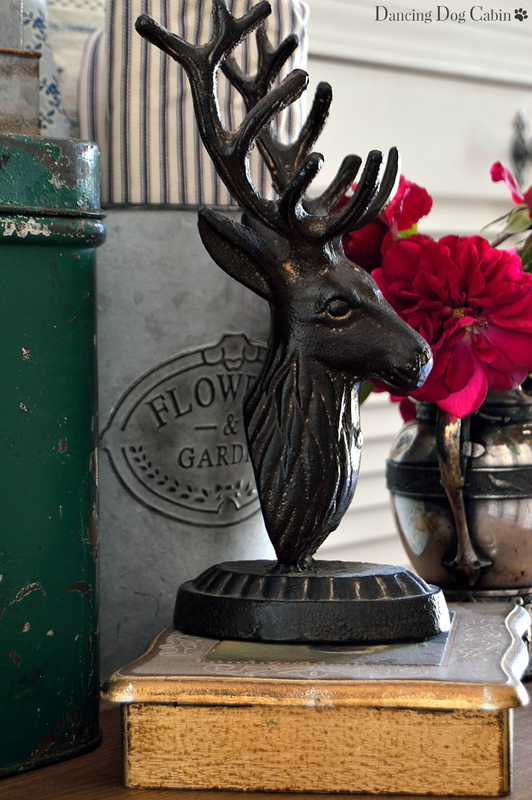 Wonderful details for your cabin. It's fun to find just the right touches, and you are well on your way. Love the table and tabletop vignette. Melissa you did enough shopping for the both of us. I love that little mule. 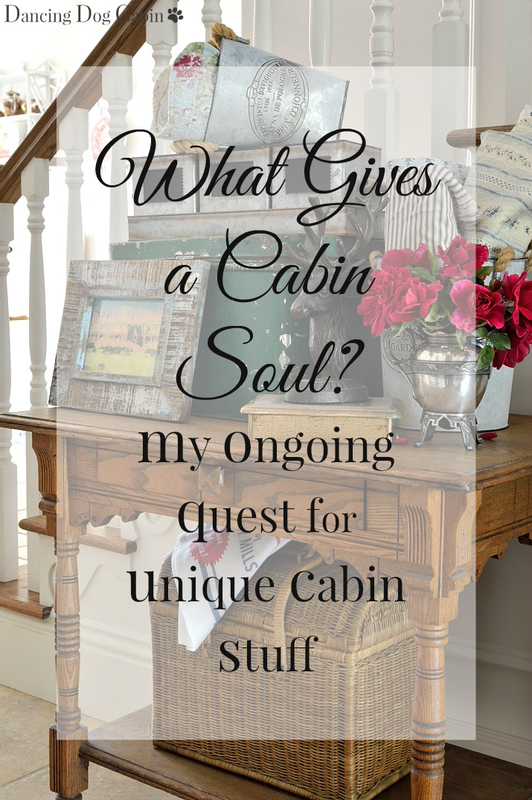 Your cabin is going to look great once you add all of these things in the right places I am hositng a new link party and would love to have you link up, it runs Friday till Tuesday and is called Sweet Inspiration. Thanks Mary! And thanks for inviting me to your link party! I agree! Thanks for visiting my blog! I am so glad that I found your blog-not really sure how I came upon it! My husband and I are in the process of building a weekend cabin as well and I have already received much inspiration from yours! Thank you so much! 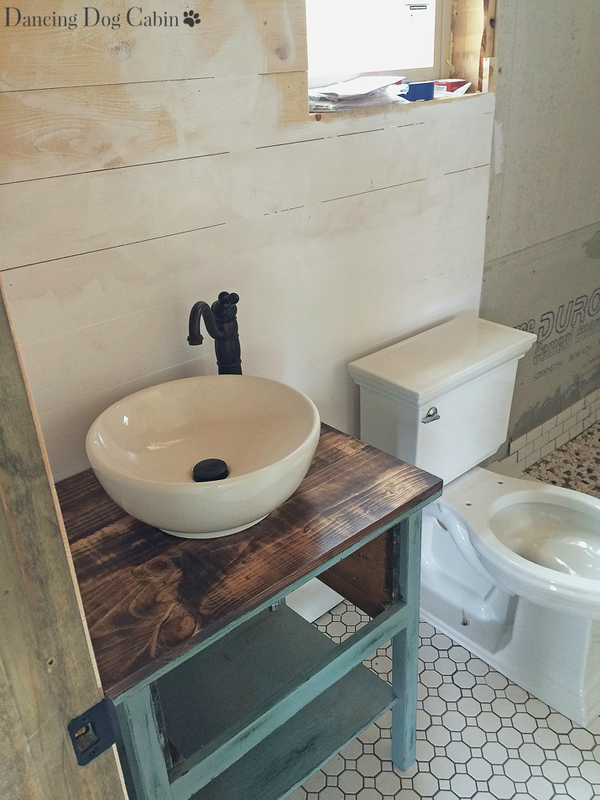 I love the bathroom vanity and small sink and am hopeful that we might have one similar in our small bath. I am also intrigued by the galvanized tin on the shower walls, we are going to apply gal. 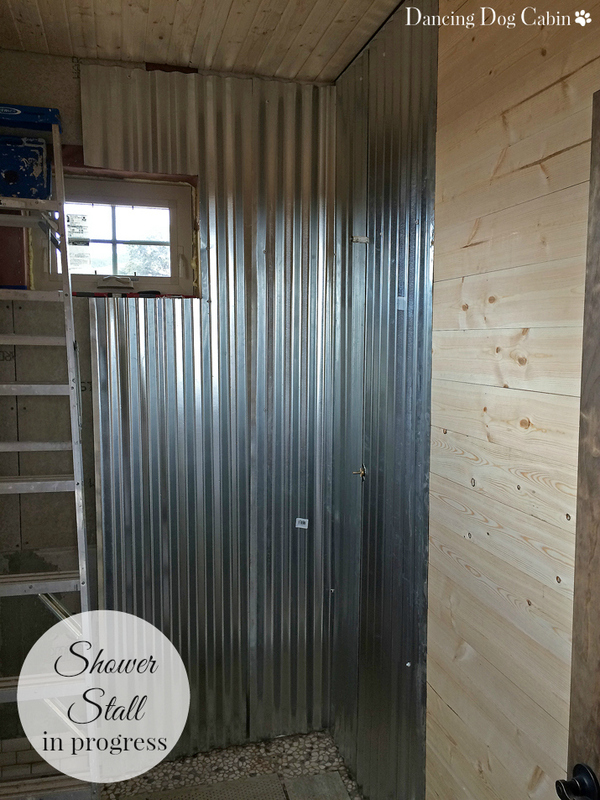 tin to the cabin's ceiling and I might be able to convince my husband to do a custom shower. Thanks so much-I will be a regular reader! Thanks Hallie, I'm glad you found me and I'm glad my blog is an inspiration. Good luck with your cabin! 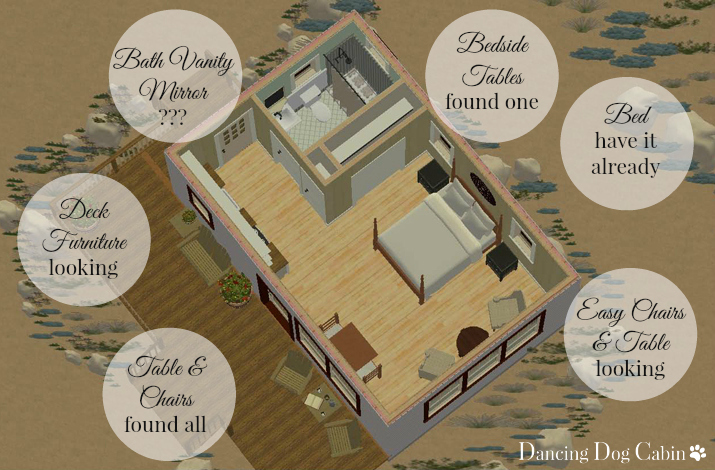 All the furniture pieces will look amazing in your cabin, I'm sure! I can't wait to see how it's going to turn out! Thank you so much for linking up at Sweet Inspiration #3! Oh I can tell you just can't wait to get all those treasures moved in. The thrill of the hunt is what keeps us all going back for more. I'm glad you found me! Yes, I definitely can't wait to get to it with the decorating. Your vignettes are amazing. Thank you for sharing on SYC! Those wooden pieces are gorgeous. Can't wait to see what you do with them. Thank you! I'm pretty happy with my latest finds. Shopping and decorating are the most fun parts! Glad you are enjoying the hunt! Love everything that you've purchased so far! Oh my gosh do I ever envy you your cabin and all your goodies to occupy cabin with you. As soon as I saw that table thought East Lake right away. 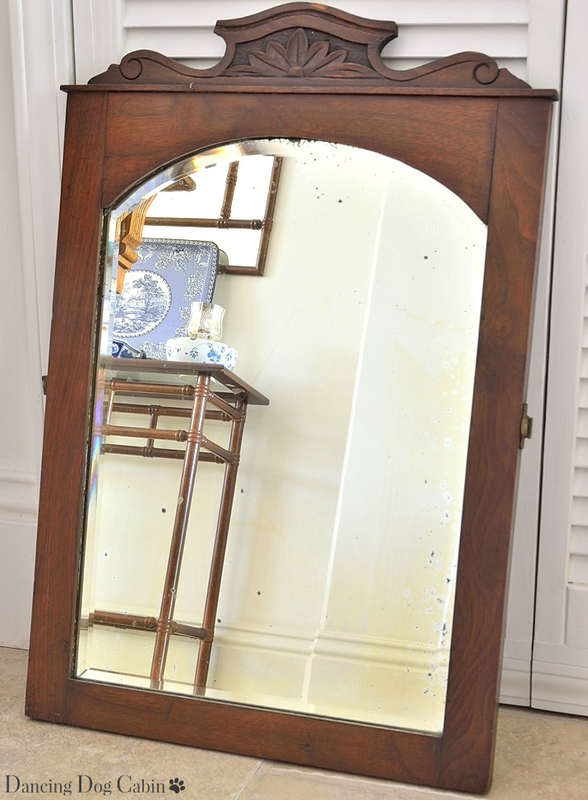 The one mirror you got is enuf leaning in that style to go with your table. 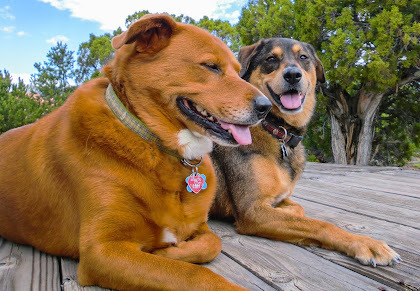 Think if we had cabin would not want to leave it, I'm bit of loner with hubs that loves to be in quiet place and learn to ruff it more. When we lived on 20 acres in MT before we got our mfg. home we were ruffing it in winter in 24 ft. travel trailer. Had to haul water into trailer for everything water needed for. I was alone as hubs on the road, sure taught me what I was made of, good for me to learn. Had to do some hard things on my own there but it was ok. Worrying about running out of propane in 30 below weather not so fun but made it ok. Would go back there in heart beat if we could have what we did then even tho am bit older now. Enjoy your wonderful cabin. Hope to see when you get cabin finished how it turns out. Wow, you are certainly brave living through Montana winters in a travel trailer! Twenty acres in Montana sounds wonderful. Like you, both my husband and I love the wide open spaces and solitude of our cabin location. Oh, you are finding some great things! Love both mirrors and the minnow bucket has to be my all time fav! We have started on a she shed and I am already chomping at the bits to decorate it. Ha, ha, just have footings in and ready to start framing. Patience, patience! :) Thanks for sharing with SYC. Thanks Jann! Good luck with your she-shed! I know how hard it is to be patient. 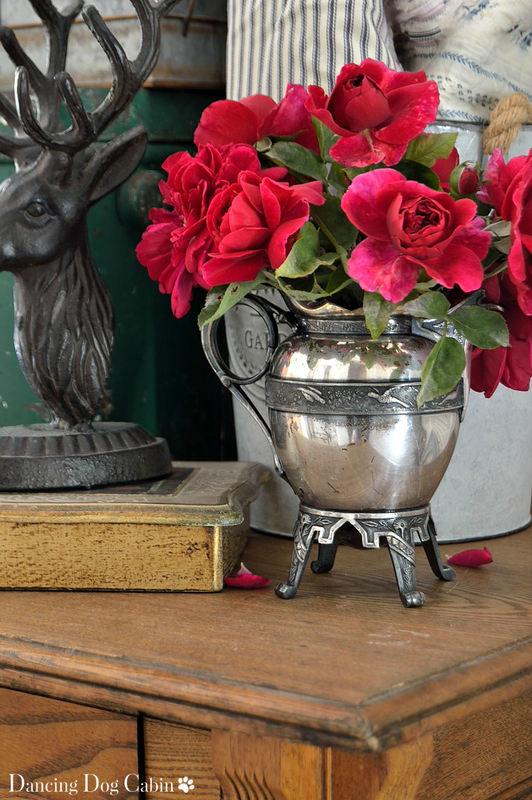 What gives a home soul is things lovely gathered over time rather than purchased at a big box store all in a few days time. Thank you! I totally agree about not getting everything at a big-box store. How boring is that? That is looking awesome! I love the minnow bucket. Thanks for sharing at Home Sweet Home! Thanks for featuring me Cecilia!